I love summer. And I love almost everything about summer. Almost. Definitely not the prolific number of bees. Or sweat stains. Or sunburn. Oh, and let’s not forget the humidity! Summertime is filled with super awesome fun, however, like swimming and pretty blue skies. Some of the other really awesome things about summer are all the festivities going on. It seems like there’s something fun to attend every weekend with fairs and carnivals and festivals. We’re loving it! So our most recent venture was to a festival in a neighboring city. It was awesome… there were stunt bicycle shows, laser tag games, all kinds of booths and vendors and games and food galore! We took both of the kids. Of course, Jonathan slept most of the time, but Nathan had a complete blast. 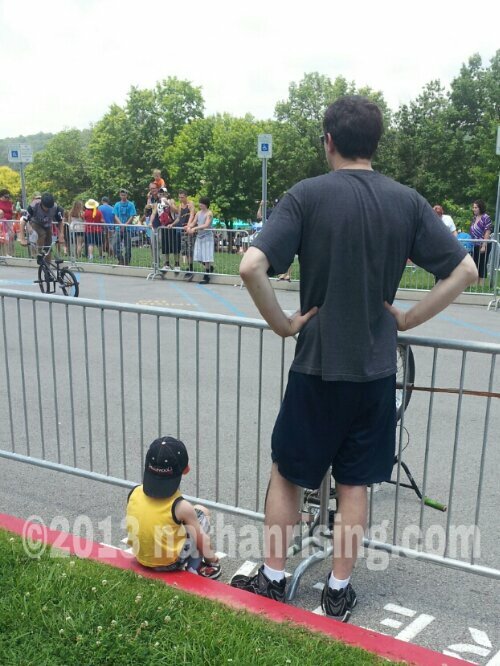 The first thing we did was watch a stunt bicycle show. Nathan loved it, especially the air stunts! Everytime one of the guys did an a jump or a flip in the air on his bicycle, Nathan would shout “YEAH!” with his arms raised triumphantly over his head. He and Paul stood right up front, and I loved seeing them with each other. Such a sweet sight. I loved watching Nathan’s reaction more than I enjoyed the show, haha. I just love seeing him have fun. So after the stunt show, we walked around for a bit. Nathan played t-ball a few times at one of the booths and let’s just say the kid definitely needs some practice! After that, we made our way over to the concession stand and gorged ourselves on some delicious food. (What is it about festival/fair/carnival food? It’s so-o-o good!) I tried to stay in the shade as much as possible because I’m so fair-skinned that I tend to burn really bad, really fast. After our lunch, Nathan spied this jumper thingy. They put you in a harness that attaches to some sort of pole above you, and you jump on these giant air pads. You can really get going, too. Some people were even doing flips. So anyway, Nathan saw it and begged to jump, even after being told he’d have to wait in that long line. I made my way over to a shaded area to change the baby’s diaper and feed him, and Paul stood with Nathan in line. By the time I was done, Nathan had successfully stood in line with his daddy (about half an hour) and did the jumping thing. He never went as high as the other kids, but he had a blast regardless! He did great for his first time! By the time he was done, we’d already been there a couple hours and needed to head home because it was really HOT outside. On our way out, Nathan begged to play in the playground. After that, as we walked to the car, we passed some vendors who had put some sidewalk chalk out, so Nathan and I drew some smiley faces before trekking back to the car. He grabbed my hand and held it, and my heart may have swelled to near-explosion size because of all the love it holds. So he had so much fun that day! We all did! I, on the other hand, got burned. Figures! (The picture is my shoulder and the white stripe you see is where my shirt was.) I hate sunburn! I’m kicking myself for forgetting sunscreen. 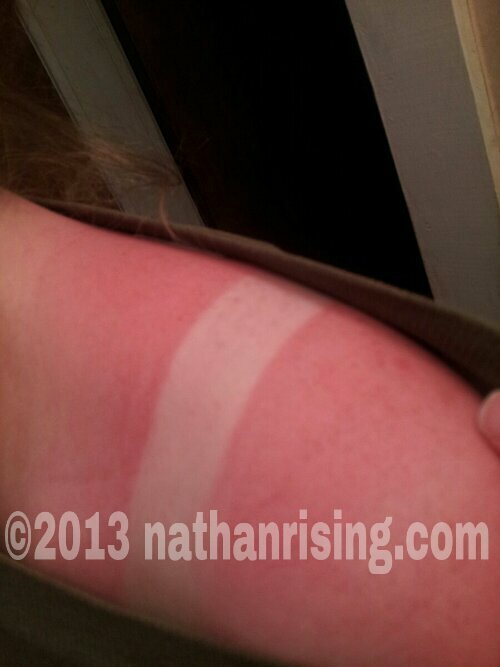 Nathan and Paul got a little sun, but barely… nothing like mine! I’m so excited about all the things we’ll be doing this summer. Especially since we’ll be living in a house that’s near parks, museums, restaurants, you name it!